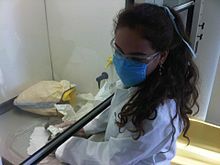 Medical student in a laboratory at Monterrey Institute of Technology and Higher Education, Mexico City. Entry-level medical education programs are tertiary-level courses undertaken at a medical school. Depending on jurisdiction and university, these may be either undergraduate-entry (most of Europe, Asia, South America and Oceania), or graduate-entry programs (mainly Australia, North America). Some jurisdictions and universities provide both undergraduate entry programs and graduate entry programs (Australia, South Korea). In general, initial training is taken at medical school. Traditionally initial medical education is divided between preclinical and clinical studies. The former consists of the basic sciences such as anatomy, physiology, biochemistry, pharmacology, pathology. The latter consists of teaching in the various areas of clinical medicine such as internal medicine, pediatrics, obstetrics and gynecology, psychiatry, general practice and surgery. However, medical programs are using systems-based curricula in which learning is integrated, and several institutions do this. In the United States, until quite recently,[when?] the requirements for the M.D. degree did not include even one course in human nutrition. Today, this omission has been rectified, at least to the extent that one such course is required. There has been a proliferation of programmes that combine medical training with research (M.D./Ph.D.) or management programmes (M.D./ MBA), although this has been criticised because extended interruption to clinical study has been shown to have a detrimental effect on ultimate clinical knowledge. Following completion of entry-level training, newly graduated doctors are often required to undertake a period of supervised practice before full registration is granted; this is most often of one-year duration and may be referred to as an "internship" or "provisional registration" or "residency". Further training in a particular field of medicine may be undertaken. In the U.S., further specialized training, completed after residency is referred to as "fellowship". In some jurisdictions, this is commenced immediately following completion of entry-level training, while other jurisdictions require junior doctors to undertake generalist (unstreamed) training for a number of years before commencing specialisation. Education theory itself is becoming an integral part of postgraduate medical training. Formal qualifications in education are also becoming the norm for medical educators, such that there has been a rapid increase in the number of available graduate programs in medical education. At present, in the United Kingdom, a typical medicine course at university is 5 years or 4 years if the student already holds a degree. Among some institutions and for some students, it may be 6 years (including the selection of an intercalated BSc—taking one year—at some point after the pre-clinical studies). All programs culminate in the Bachelor of Medicine and Surgery degree (abbreviated MBChB, MBBS, MBBCh, BM, etc.). This is followed by 2 clinical foundation years afterward, namely F1 and F2, similar to internship training. Students register with the UK General Medical Council at the end of F1. At the end of F2, they may pursue further years of study. The system in Australia is very similar, with registration by the Australian Medical Council (AMC). In the US and Canada, a potential medical student must first complete an undergraduate degree in any subject before applying to a graduate medical school to pursue an (M.D. or D.O.) program. U.S. medical schools are almost all four-year programs. Some students opt for the research-focused M.D./Ph.D. dual degree program, which is usually completed in 7–10 years. There are certain courses that are pre-requisite for being accepted to medical school, such as general chemistry, organic chemistry, physics, mathematics, biology, English, labwork, etc. The specific requirements vary by school. As medical professional stakeholders in the field of health care (i.e. entities integrally involved in the health care system and affected by reform), the practice of medicine (i.e. diagnosing, treating, and monitoring disease) is directly affected by the ongoing changes in both national and local health policy and economics. There is a growing call for health professional training programs to not only adopt more rigorous health policy education and leadership training, but to apply a broader lens to the concept of teaching and implementing health policy through health equity and social disparities that largely affect health and patient outcomes. Increased mortality and morbidity rates occur from birth to age 75, attributed to medical care (insurance access, quality of care), individual behavior (smoking, diet, exercise, drugs, risky behavior), socioeconomic and demographic factors (poverty, inequality, racial disparities, segregation), and physical environment (housing, education, transportation, urban planning). A country’s health care delivery system reflects its “underlying values, tolerances, expectations, and cultures of the societies they serve”, and medical professionals stand in a unique position to influence opinion and policy of patients, healthcare administrators, & lawmakers. One 2010 survey of U.S. medical school deans of education regarding health policy education initiatives found that of the 160 accredited M.D. and D.O schools surveyed, 58% responded to report that while 94% of them had "some form" of policy education, 74% required that education and only 24% had courses directly on the topic of health policy. 58% reported room for improvement, while 52% were currently in the processing of adapting their policy curriculums. Still, the average amount of time spent with health policy instruction was only 14 hours (SD 12 hours) over the four years of medical school training. In order to truly integrate health policy matters into physician and medical education, training should begin as early as possible – ideally during medical school or premedical coursework – to build “foundational knowledge and analytical skills” continued during residency and reinforced throughout clinical practice, like any other core skill or competency. This source further recommends adopting a national standardized core health policy curriculum for medical schools and residencies in order to introduce a core foundation in this much needed area, focusing on four main domains of health care: (1) systems and principles (e.g. financing; payment; models of management; information technology; physician workforce), (2) quality and safety (e.g. quality improvement indicators, measures, and outcomes; patient safety), (3) value and equity (e.g. medical economics, medical decision making, comparative effectiveness, health disparities), and (4) politics and law (e.g. history and consequences of major legislations; adverse events, medical errors, and malpractice). However limitations to implementing these health policy courses mainly include perceived time constraints from scheduling conflicts, the need for an interdisciplinary faculty team, and lack of research / funding to determine what curriculum design may best suit the program goals. Resistance in one pilot program was seen from program directors who did not see the relevance of the elective course and who were bounded by program training requirements limited by scheduling conflicts and inadequate time for non-clinical activities. But for students in one medical school study, those taught higher-intensity curriculum (vs lower-intensity) were “three to four times as likely to perceive themselves as appropriately trained in components of health care systems”, and felt it did not take away from getting poorer training in other areas. Additionally, recruiting and retaining a diverse set of multidisciplinary instructors and policy or economic experts with sufficient knowledge and training may be limited at community-based programs or schools without health policy or public health departments or graduate programs. Remedies may include having online courses, off-site trips to the capitol or health foundations, or dedicated externships, but these have interactive, cost, and time constraints as well. Despite these limitations, several programs in both medical school and residency training have been pioneered. Lastly, more national support and research will be needed to not only establish these programs, but to evaluate how to both standardize and innovate the curriculum in a way that is flexible with the changing health care and policy landscape. In the United States, this will involve coordination with the ACGME (Accrediting Council for Graduate Medical Education), a private NPO that sets educational and training standards for U.S. residencies and fellowships that determines funding and ability to operate. ^ Flores-Mateo G; Argimon JM (26 July 2007). "Evidence based practice in postgraduate healthcare education: A systematic review". BMC Health Serv Res. 7: 119. doi:10.1186/1472-6963-7-119. PMC 1995214. PMID 17655743. ^ Dang, Timothy M.; Maggio, Lauren A. (March 2017). "Supporting the Call to Action". Academic Medicine. 92 (3): 403–416. doi:10.1097/ACM.0000000000001532. PMID 28225733. ^ Hark, Lisa A.; Deen, Darwin D.; Morrison, Gail (2015). "Learner-Directed Nutrition Content for Medical Schools to Meet LCME Standards". Journal of Biomedical Education. 2015: 1–12. doi:10.1155/2015/469351. ^ Dyrbye LN; Thomas MR; Natt N; Rohren CH (2007). "Prolonged Delays for Research Training in Medical School are Associated with Poorer Subsequent Clinical Knowledge". J Gen Intern Med. 22 (8): 1101–6. doi:10.1007/s11606-007-0200-x. PMC 2305740. PMID 17492473. ^ Tekian, A; Artino, AR (September 2013). "AM last page: master's degree in health professions education programs". Academic Medicine. 88 (9): 1399. doi:10.1097/ACM.0b013e31829decf6. PMID 23982511. ^ Tekian, A; Artino, AR (September 2014). "AM last page. Overview of doctoral programs in health professions education". Academic Medicine. 89 (9): 1309. doi:10.1097/ACM.0000000000000421. PMID 25006714. ^ Ahmed K; Ashrafian H; Hanna GB; Darzi A; et al. (Oct 2009). "Assessment of specialists in cardiovascular practice" (PDF). Nature Reviews Cardiology. 6 (10). ^ Cervero, RM; Artino, AR; Daley, BJ; Durning, SJ (2017). "Health Professions Education Graduate Programs Are a Pathway to Strengthening Continuing Professional Development". The Journal of Continuing Education in the Health Professions. 37 (2): 147–151. doi:10.1097/CEH.0000000000000155. PMID 28562504. ^ Artino, Anthony R.; Cervero, Ronald M.; DeZee, Kent J.; Holmboe, Eric; Durning, Steven J. (April 2018). "Graduate Programs in Health Professions Education: Preparing Academic Leaders for Future Challenges". Journal of Graduate Medical Education. 10 (2): 119–122. doi:10.4300/JGME-D-18-00082.1. PMC 5901787. PMID 29686748. ^ Ellaway R; Masters K. (2008). "AMEE Guide 32: e-Learning in medical education Part 1: Learning, teaching and assessment". Med Teach. 30 (5): 455–473. CiteSeerX 10.1.1.475.1660. doi:10.1080/01421590802108331. PMID 18576185. ^ Masters K; Ellaway R (2008). "e-Learning in medical education Guide 32 Part 2: Technology, management and design". Med Teach. 30 (5): 474–489. doi:10.1080/01421590802108349. PMID 18576186. ^ Evans, KH; Thompson, AC; O'Brien, C; Bryant, M; Basaviah, P; Prober, C; Popat, RA (May 2016). "An Innovative Blended Preclinical Curriculum in Clinical Epidemiology and Biostatistics: Impact on Student Satisfaction and Performance". Academic Medicine. 91 (5): 696–700. doi:10.1097/ACM.0000000000001085. PMID 26796089. ^ Tang, Brandon; Coret, Alon; Qureshi, Aatif; Barron, Henry; Ayala, Ana Patricia; Law, Marcus (2018). "Online Lectures in Undergraduate Medical Education: Scoping Review". JMIR Medical Education. 4 (1): e11. doi:10.2196/mededu.9091. PMC 5915670. PMID 29636322. ^ Favreau, Annie. "Minnesota Virtual Clinic Medical Education Software". Regents of the University of Minnesota. Archived from the original on 2012-03-24. Retrieved 2011-09-13. ^ Cook, DA; Hatala, R; Brydges, R; Zendejas, B; Szostek, JH; Wang, AT; Erwin, PJ; Hamstra, SJ (7 September 2011). "Technology-enhanced simulation for health professions education: a systematic review and meta-analysis". JAMA. 306 (9): 978–88. doi:10.1001/jama.2011.1234. PMID 21900138. ^ "Medicine - Find My Pathway". Find My Pathway. Retrieved 2018-10-26. ^ (RACS), Royal Australasian College of Surgeons. "Pathways through specialty medical training". www.surgeons.org. Retrieved 2018-10-26. ^ Steinberg, Michael L. (2008). "Introduction: Health Policy and Health Care Economics Observed". Seminars in Radiation Oncology. 18 (3): 149–151. doi:10.1016/j.semradonc.2008.01.001. PMID 18513623. ^ a b Schwartz, R. W.; Pogge, C. (2000-09-01). "Physician leadership: essential skills in a changing environment". American Journal of Surgery. 180 (3): 187–192. CiteSeerX 10.1.1.579.8091. doi:10.1016/s0002-9610(00)00481-5. ISSN 0002-9610. PMID 11084127. ^ Gee, Rebekah E.; Lockwood, Charles J. (2013-01-01). "Medical education and health policy: what is important for me to know, how do I learn it, and what are the gaps?". Obstetrics and Gynecology. 121 (1): 9–13. doi:10.1097/AOG.0b013e31827a099d. ISSN 1873-233X. PMID 23262923. ^ a b c Patel, Mitesh S.; Davis, Matthew M.; Lypson, Monica L. (2011-02-24). "Advancing Medical Education by Teaching Health Policy". New England Journal of Medicine. 364 (8): 695–697. doi:10.1056/NEJMp1009202. ISSN 0028-4793. PMID 21345098. ^ a b c Heiman, Harry J.; Smith, L. Lerissa; McKool, Marissa; Mitchell, Denise N.; Roth Bayer, Carey (2015-12-23). "Health Policy Training: A Review of the Literature". International Journal of Environmental Research and Public Health. 13 (1): 20. doi:10.3390/ijerph13010020. PMC 4730411. PMID 26703657. ^ a b Avendano, Mauricio; Kawachi, Ichiro (2014-01-01). "Why do Americans have shorter life expectancy and worse health than do people in other high-income countries?". Annual Review of Public Health. 35: 307–325. doi:10.1146/annurev-publhealth-032013-182411. ISSN 1545-2093. PMC 4112220. PMID 24422560. ^ Williams, Tim R. (2008). "A Cultural and Global Perspective of United States Health Care Economics". Seminars in Radiation Oncology. 18 (3): 175–185. doi:10.1016/j.semradonc.2008.01.005. PMID 18513627. ^ Beyer, David C.; Mohideen, Najeeb (2008). "The Role of Physicians and Medical Organizations in the Development, Analysis, and Implementation of Health Care Policy". Seminars in Radiation Oncology. 18 (3): 186–193. doi:10.1016/j.semradonc.2008.01.006. PMID 18513628. ^ Mou, David; Sarma, Aartik; Sethi, Roshan; Merryman, Reid (2011-03-10). "The State of Health Policy Education in U.S. Medical Schools". New England Journal of Medicine. 364 (10): e19. doi:10.1056/NEJMp1101603. ISSN 0028-4793. PMID 21345091. ^ a b Greysen, S. Ryan; Wassermann, Travis; Payne, Perry; Mullan, Fitzhugh (2009-10-28). "Teaching Health Policy to Residents—Three-Year Experience with a Multi-Specialty Curriculum". Journal of General Internal Medicine. 24 (12): 1322–1326. doi:10.1007/s11606-009-1143-1. ISSN 0884-8734. PMC 2787946. PMID 19862580. ^ Patel, Mitesh S.; Lypson, Monica L.; Davis, Matthew M. (2009). "Medical Student Perceptions of Education in Health Care Systems". Academic Medicine. 84 (9): 1301–1306. doi:10.1097/acm.0b013e3181b17e3e. PMID 19707077. ^ Catalanotti, Jillian; Popiel, David; Johansson, Patrik; Talib, Zohray (2014-01-07). "A Pilot Curriculum to Integrate Community Health Into Internal Medicine Residency Training". Journal of Graduate Medical Education. 5 (4): 674–677. doi:10.4300/jgme-d-12-00354.1. PMC 3886472. PMID 24455022. ^ Rovner, Julie (June 9, 2016). "This Med School Teaches Health Policy Along With The Pills". Retrieved December 13, 2016 – via NPR and Kaiser Health News (KHN). Wikisource has the text of the 1911 Encyclopædia Britannica article Medical Education.